Since our company’s inception in 1987, Service Konstruction Supply, Inc. has been providing hardscape material solutions to the construction industry through the use of innovative, state of the art products. Service Konstruction Supply not only provides the highest quality products, but also offers the most knowledgeable and professional service and support. 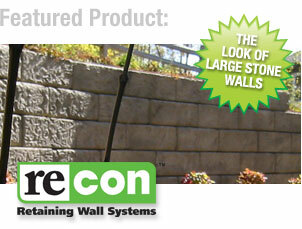 Recon Wall Systems has provided Service Konstruction Supply the exclusive manufacturing territory of Northern Illinois, Southeastern Wisconsin and Northwestern Indiana. Over 4,000,000 Square feet of modular Wall Sales! Service Konstruction Supply, Northern Illinois’ modular wall expert, has surpassed 4,000,000 square feet in modular wall material sales in Northern Illinois. Pinnacle retaining wall material, exclusively supplied by SKS, is becoming installation contractors preferred modular wall system.